One of the Bay Area’s best saxophonists is the incomparable Hermann Lara. Celebrating the arrival of his debut CD, “New Mission”, which was recorded live at the historic former Mercury & CBS Records Studios on Mission Street in San Francisco. 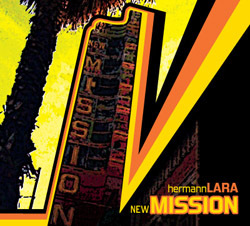 New Mission delivers 11 original, classic set tunes in an array of jazz rhythms. Legendary guitarist and 6 time Grammy Nominee, Mike Stern, makes a special guest appearance and the all-star packed roster of musicians on this disc deliver what are sure to be some of most exciting musical moments of 2011. Based in San Francisco, saxophonist and woodwind player, Hermann Lara holds a Bachelor’s of Music from the Berklee College of Music in Boston, MA (1996) and a few notches earned in the bandstand as well. As a husband, father, business man, teacher and musician he’s in a unique position to convey the complexities and beauty of modern life in America through music. Hermann has performed with such music greats as Paquito Guzman, Pedro Arroyo, Giovanni Hidalgo and grammy winner Lalo Rodriguez. He’s recently recorded Fito Reinoso’s Ritmo y Armonia, Tito y Su Son De Cuba and singer/songwriter’s JL Stiles and Amelia Ray. “New Mission” is an album well worth adding to your collection, from one of the most creative minds on the local scene.